14-year-old Tomokazu HARIMOTO has rocked the world by defeating 2012 Olympic Champion ZHANG Jike to become the Seamaster 2018 World Tour Lion Japan Open champion. HARIMOTO, who yesterday shocked the sporting world by defeating 2016 Olympic champion MA Long was again in scintillating form and playing table that is unheard of for someone his age. In arguably the best match so far in 2018, HARIMOTO managed to save one match point to win one of the all-time classic matches 9-11, 8-11, 11-9, 11-4, 10-12, 11-7, 13-11 by serving an ace on his second match point to make the sellout crowd go into hysterics. ZHANG Jike was the fresher player for the match, after his semi-final opponent Timo BOLL (GER) was forced to withdraw with a neck injury. HARIMOTO had to play a tough match against LEE Sangsu (KOR) which he was able to win 4-2 to set up the match with the living legend ZHANG Jike that we will all never forget. Mima ITO continued her amazing year by claiming her first ever Japan Open. 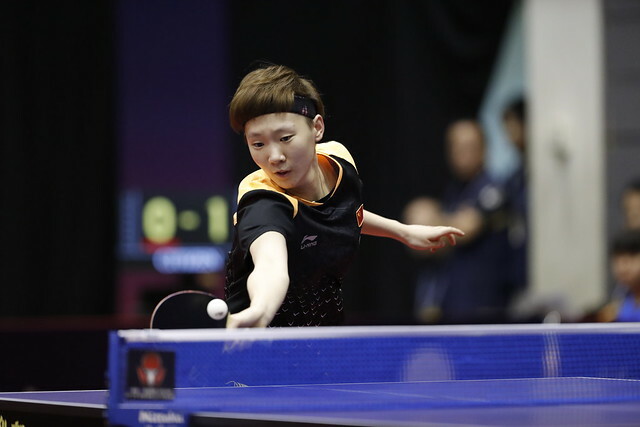 The 18-year-old won the battle of the teenagers, by defeating WANG Manyu to stop her from completing her hat-trick of World Tour titles after her victories in Hong Kong and China the past two weekends. In a topsy turvy match, Mima ITO was able to take the crucial points and close out the match 11-7, 12-10, 8-11, 11-7, 6-11, 12-10 against WANG who will become the world #1 on 1 July after already winning three ITTF World Tour titles in 2018. Mima ITO was close to not even being in the final, as she was down 0-3 4-9 in her semi-final match against CHEN Xingtong (CHN). ITO was able to turn around the match to win in a nail biter 4-3 which gave her the chance to become the champion, which she took with both arms. GU Yuting & MU Zi (CHN) were awarded the gold medal after LIU Shiwen & WANG Manyu withdrew from the match due to LIU Shiwen suffering a hip injury in her semi-final loss against her doubles partner WANG Manyu. JEOUNG Youngsik & LEE Sangsu (KOR) were too strong for LIANG Jingkun & ZHOU Kai (CHN) in the men’s doubles, winning 11-6, 5-11, 11-9, 11-5. After three straight events, the Seamaster ITTF World Tour takes a five-week break and returns for the Korea Open on 19-22 July in Daejeon, Korea.